These demons are learning the hard way; you don’t mess with Gabe when he’s got a hangover. This Thursday evening we’ve got our first Demon Hunters Hangout for patrons who pledged $15 or more last month. If that’s you, you should have already received your invitation. Let me know if you haven’t and I’ll make sure you get all the information you need. We’ll be hanging around for a while, so drop in for a chat. Note to self: put on a shirt. 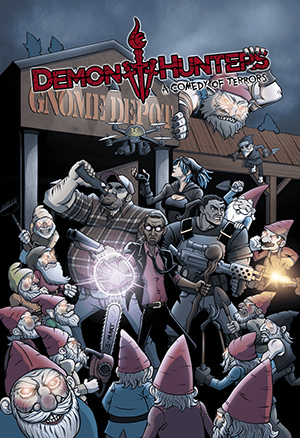 And if you want to get in on the fun next month, check out our Patreon campaign and become a Demon Hunters Patron today! Every dollar you give makes the comic a teensy bit better! Gabriel smiles and adopts a battle stance. Closeup on Crawly, jaws open and slavering. Gabriel dashes forward in a ninja run, rebar held behind him in a reverse grip. Golden light drips from the metal rod. Floaty and Crawly rush to meet him, with Crawly in the lead. Gabriel turns and takes aim at Floaty's underbelly. He grips the rebar with both hands and looks up at his target, who stares back with fear in his eyes. All of his eyes. And this is why paladins get spells, like Bless Weapon.